The European Central Bank left its interest rates unchanged, including the deposit rate, which will not be "tiered" anytime soon, according to President Mario Draghi. They also left the forward guidance unchanged, thus signaling no rate hikes this year. The ECB said the interest rate on the main refinancing operations and the interest rates on the marginal lending facility and the deposit facility will remain unchanged at 0.00%, 0.25% and -0.40% respectively on Thursday, March 7. While the decision on rates was in line with market expectations, the forward guidance on rates turned more dovish. The ECB and President Draghi went fully dovish sending the euro down. There are five significant moves that will continue reverberating. It is time to look at the next significant downside levels as EUR/USD falls out of balance. Mario Draghi, the European Central Bank President did his best to sound positive in his press conference following the bank's policy announcement but economic reality kept intruding. The ECB’s concerns come as European economies are showing increasing signs of distress. Perhaps Mr. Draghi’s good cheer was because the economic outcome is largely out of his hands. Or maybe it is because his tenure is up in October. Draghi can't avoid sounding somewhat dovish, but at the same time reluctant to draw conclusions until the ECB economics staff comes up with new forecasts in March and the policy board actually talks about alternative paths. The European Central Bank left its policy and messages unchanged. The interest rate may still rise in September despite growing signs of a slowdown. 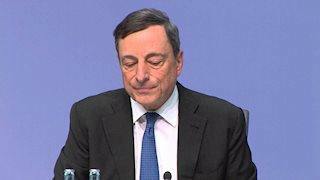 President Mario Draghi balanced between acknowledging the downturn but expressing optimism. The European Central Bank is the central bank empowered to manage monetary policy for the Eurozone. With its beginnings in Germany 1998, the ECB is empowered to maintain price stability in the euro area, so that the euro’s purchasing power is not eroded by inflation. As an entity independent of individual EU countries and EU institutions, the ECB aims to ensure that the year-on-year increase in consumer prices is less than, but close to 2% over the medium term. Another of its tasks is the one of controlling the money supply. This involves, for example, setting interest rates throughout the euro area. The European Central Bank’s work is organized via the following decision-making bodies: the Executive Board, the Governing Council and the General Council. Mario Draghi, member of the Executive Board, is also the President of this organism. His speeches, statements and declarations are an important source of volatility, especially for the Euro and the currencies traded against the European currency. Mario Draghi was born in 1947 in Rome, Italy. Graduated of the Massachusetts Institute of Technology, he became President of the European Central Bank in 2011. Draghi gives press conferences in the back of how he observes the current European economy. His comments may determine positive or negative trends for the Euro in the short-term. Usually, a hawkish outlook is seen as positive/bullish for the EUR, while a dovish one is seen as negative/bearish. Many traders buy the rumors and square their positions shortly after the decision is made. For instance, if the market believes that the European Central Bank will hike the rate; traders buy the Euro and close the position shortly after the announcement. On the other hand, if the expectation is a rate decrease, traders will short the Euro and square the position after the announcement. If the market’s expectations differ from the actual rate decision there can be some excellent trading opportunities. If the market is expecting a rate hike, but the European Central Bank ends up cutting the interest rate, a short 1-2 hour trade selling the Euro may prove successful. If the market expects a rate cut, but the ECB comes in with an increase in the rate, a trader may want to place a short long position on the Euro for 1-2 hours. The decision always has an effect on the Euro. When the interest rate is increased the European Central Bank is literally selling government securities to large financial firms. In turn, the financial organizations are paying in Euros for these securities. This effectively decreases the amount of currency circulating in the economy. A decreasing supply leads to higher demand, and therefore causes the value of the Euro to appreciate. When the interest rates are decreased, the European Central Bank floods the market with Euros. This is done by the purchasing government securities from financial organizations. In return for the securities, these banks and financial deals are paid in Euros, therefore increasing the supply of Euros in the economy. As supply increases, the value of the Euros depreciates. What is ECB Quantitative Easing? In practical terms, QE means that central banks create money out of nothing to buy securities, such as government bonds. This new money swells the size of bank reserves by the quantity of assets purchased and that’s why this programme is called Quantitative Easings. The money supply is intended to flood financial institutions with capital in an effort to stimulate lending and increase liquidity. Much of the governments’ debt is held by banks in the Eurozone and the ECB wants them to give more credits. If the European Central Bank buys government bonds, their prices rise and profitability drop even more. This is a liquidity-providing operation that weakens the value of the euro. This depreciation makes European exports cheaper and competitive, and ultimately, helps in recovering. In addition, as a result of the stimulus to internal and external consumption, the ECB combats the risk of deflation, a widespread and prolonged drop in prices, as well as the high unemployment. The long term refinancing operation (LTRO) is a cheap loan scheme for European banks that was announced by the European Central Bank towards the end of 2011 in a bid to help ease the eurozone crisis. Round one was carried out on 21 December, when banks took €489 billion from the European Central Bank. The loans are due to be repaid within three years at a rate of 1%, and a second round will be launched on 28 February, with the results of how much money was requested due on 29 February.